Apple's 12-inch MacBook vs. Windows laptops: Fight! A delicate wallflower of a laptop, the Dell Latitude 12 E5250 is not. As a matter of fact, I wouldn’t bet against it in a fight with its Latitude 14 and 15 siblings—our touchscreen model of the 12 was actually thicker and not a whole lot lighter. That’s not knocking the E5250; it’s extremely sturdy and a good performer. However, considering the minimal weight savings, you might consider the Latitude 14 and 15 5000 series with their larger displays and keyboards. The E5250 comes in a variety of configurations, from a $919 model with a Core i5 5200U, 4GB of system memory, and a 500GB, 7,200rpm drive, to the near high-end $1320, Core i5 5200U, 8MB, 128GB SSD configuration that I tested. You can pay even more if you want a larger 256GB SSD and the slightly faster i5-5300U CPU. Note that those prices are discounted “Dell” prices, which, to the best of my knowledge, are in effect at all times, despite a more expensive “list” price that’s always quoted. All E5250 models have 12.5-inch displays. The less expensive models deliver 1366x768 resolution, and the pricier models such as ours, 1920x1080 (with or without touch). Ours had lots of usable brightness, a wide viewing angle, and showed off 1080 movies and photos properly. But a lot of users will want to increase font size to avoid eyestrain. 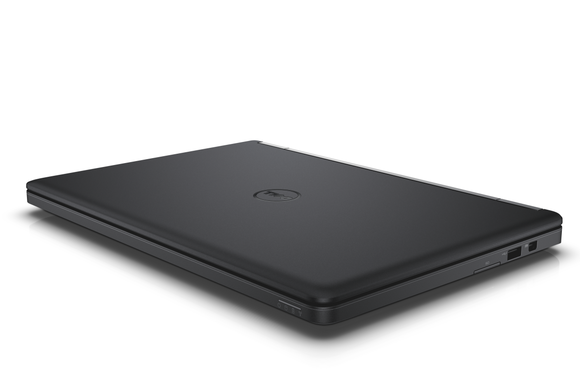 Dell refers to the Latitude 12 5000 series as thin and light. I'm not sure which standard the company is going by, but it's not mine. The E5250 I toted around weighed 4.1 pounds and measured a full inch thick. That's heavy for a laptop that measures a little over 12 inches wide by about 8.25 inches deep. Indeed, that's only 0.2 pounds less than the Latitude 14 (14-inch) E5450. While the E5250 is obviously not over a foot high, our touchscreen test model was about 2 millimeters thicker than the Latitude 14 or 15 5000 series and the non-touchscreen Latitude 12 5000. Admittedly, the short horizontal dimensions make the E5250 seem thicker than it is, but it's simply not thin or light. The up side to the E5250's stockiness that is that there’s plenty of room for a large 51Wh battery. Said energy cell will power the laptop for about 4 hours and 2 minutes according to PC Mark's work run-down test which is far more intensive than normal use. It ran for a couple of hours longer in my subjective test. The battery is internal, so you must remove the bottom cover to access it, but that’s a matter of a mere 6 screws. Once the panel is off you also have access to the mSATA SSD (which resides on a removable daughterboard), the WWAN slot, the SIMM card slot, and a second free SODIMM slot. Pretty easy maintenance and upgrade there. The E5250’s ports are scattered around the edges, but the selection is a capable modern mix. There’s mini-DisplayPort, USB 3.0 (always-on), and SD card slot on the right; two USB 3.0 ports, an HDMI port, and gigabit Ethernet on the back, and the audio jack and smart card reader on the left. Wi-Fi is 802.11 AC and there’s Bluetooth 4.0 on board. The power jack is on the back of the unit so you can keep the E5250 plugged in without the cord constantly getting in the way, as it does with most laptops. I like it. There are several docking options available for the E5250: the E-Port Plus for $157.68 (don’t ask us how they come up with these prices), plain E-Port for $121.68, and the Dell Universal Dock and Monitor Stand for $179.99 (finally a normal price!). 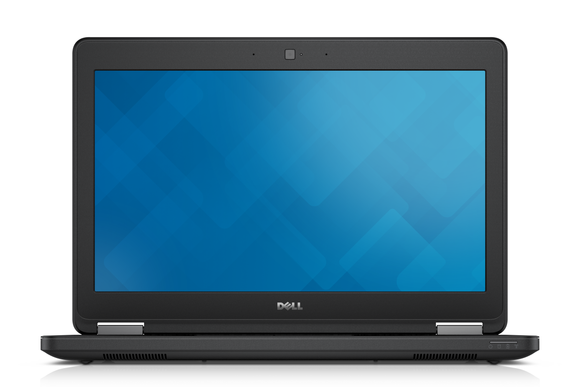 The warranty was a single-year, but this being one of Dell’s business-oriented laptops, there’s a wide variety of service and support plans available up to five years in length. The Broadwell U CPU is basically dead even with the previous version's Haswell U chip but easily outruns thinner and lighter notebooks. Our test E5250’s performance was quite good. It turned in a PC Mark 8 Work Conventional score of 2,742 and a Creative Conventional score of 2,203. Those are slightly lower than the 2,841 and 2,242 achieved by the older Core i5 4310-based model we were originally sent but it's basically a tie. No doubt the slightly pricier Core i5 5300U configurations would add more performance. 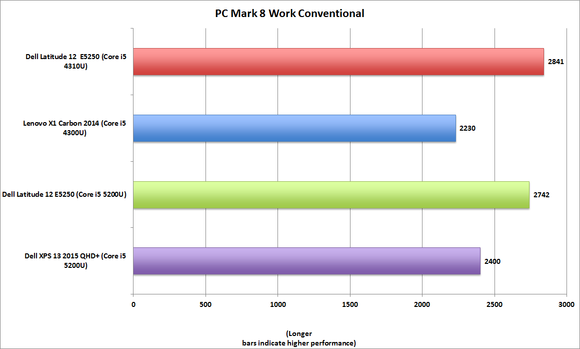 For reference, we've also included PC Mark 8 Work Conventional scores from a pair of ultrabooks and there is a considerable performance difference that's attributable to tighter thermal controls of the ultrabooks. Gaming frame rates, as with all Intel integrated graphics, are suited only for older generation or Web games. Not that you can’t have a lot of fun with those. The Samsung PM851 SSD was a bit of a mixed story: CrystalDiskMark rated 4GB file transfers at 462MBps reading, but only 136MBps writing. That means you get the quick feel of an SSD, except when you're saving large files. Subjectively, I found navigating the Windows 8.1 operating system and running apps a facile experience. Not surprising given the SSD. Movies looked great, and the unit’s speakers actually sounded decent. I wouldn’t exactly call what’s emanating from them bass, but it’s closer to it than a lot of laptops manage. The keyboard types nicely and the touchpad was responsive with firm buttons. It may be thick but performance was good and it has a solid feel to it. 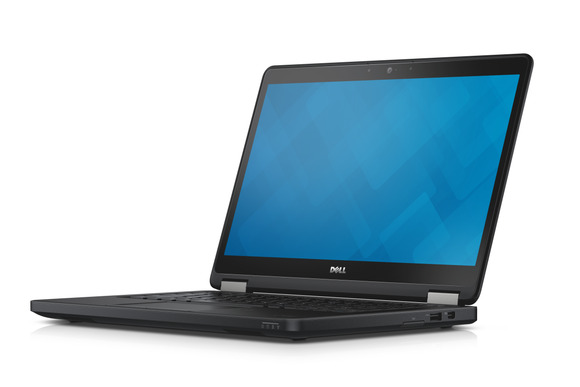 The Latitude 12 E5250 is a capable laptop with state-of-the-art connectivity and good performance. Personally, I’d opt for a Latitude 14 or 15 with a larger display and keyboard at roughly the same weight. But tastes vary, and if you or your business like the Latitude 12 5000 series form factor, and can afford one, by all means. Note: You can get into a Latitude 12 for less money with the 3000 series and pay more for the security-minded (TPM, biometrics) 7000 series.